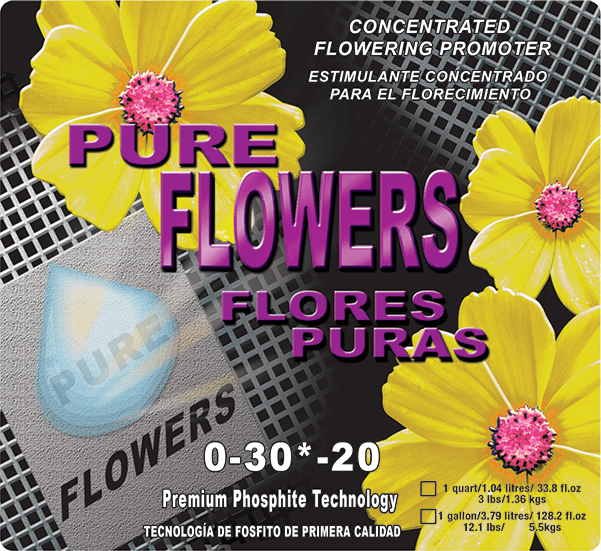 Pure Flowers 0-30-20 liquid is scientifically formulated with cutting edge phosphite technology and possesses the highest nutrient levels ever achieved in a completely solubilized liquid. This ultimate flowering supplement will maximize your crop’s yield and boost the crop’s immune system, which in turn will able to better resist powdery mildew, brown rot and other harmful fungi. While protecting, the solution also accelerates flower development and increases yields. Flowering Stage and Heavy Fruiting: Use at a rate of 0.25ml per litre (0.2tsp per gallon) of water once per week or with every feeding. Flowering Stage and Heavy Fruiting: Use at a rate of 0.5ml per litre (0.4tsp per gallon) of water twice per week. Foliar Application: Use at a rate of 2ml per litre (1.6tsp per gallon) of water and mist leaves once per week during the flowering stage.